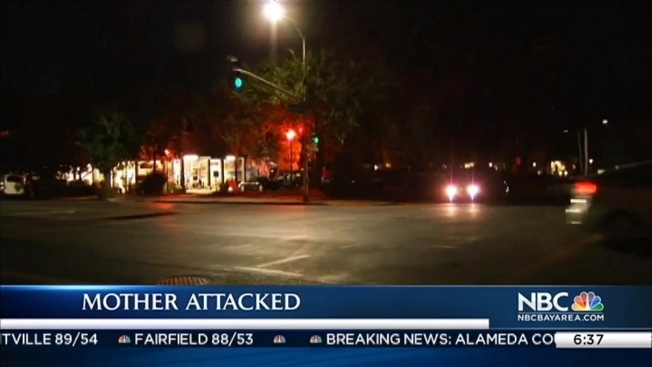 Palo Alto police are looking for a man who came up to a woman pushing her baby in a stroller, punched her in the head, and took her purse before running away. The woman sustained minor injuries, police said, and her child was unharmed. Police released a sketch of the suspect Monday night. Lt. Zach Perron said that the strong-arm robbery was reported on Sunday at 6:39 p.m in the 3100 block of Middlefield Road, just north of Loma Verde Avenue. When police arrived, they found a woman in her 30s had been pushing her baby in the stroller, and when she bent down to attend to her crying infant, someone tugged on her purse, and then punched her in the side of her head. The man ripped the purse from her shoulder, police said, before running away. She suffered a small abrasion to her ear, but declined medical attention. Multiple witnesses saw either the assault or the immediate aftermath, and two people followed the man as he ran eastbound on Loma Verde Avenue from Middlefield Road before they lost sight of him, police said. The witnesses described the suspect as a man in his 20s with a stocky build, standing about 5 feet 3 inches to 5 feet 6 inches tall. The suspect may have had a full beard. He was wearing a black sweatshirt with the hood pulled up over a baseball hat, and also was wearing jeans.. Anyone with information should call (650) 329-2413. Anonymous tips can be e-mailed to paloalto@tipnow.org or sent via text message or voice mail to 650-383-8984.